For the second entry in my loose series linking to old pictures from Islay and Jura we travel to the Isle of Jura, to what remains of the crofting village of Keils. 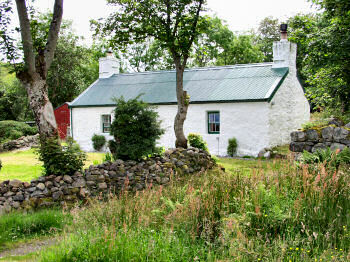 The village is just north of Craighouse, overlooking the Bay of Small Isles. I've been to Keils twice, first in 2002 and then again for a walk around Craighouse and Keils during WalkIslay 2004. It has changed a lot over time and still is changing. 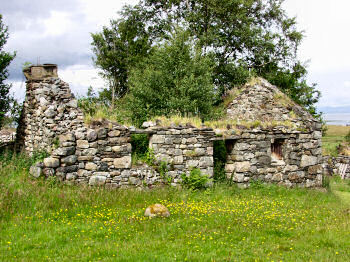 Keils once was a thriving crofting community, today almost only ruins remain. A handful of homes have been restored and I remember a few more being worked on when we visited during the walk in 2004. Nevertheless these small island communities are struggling to retain older residents as well as attracting younger families, partly because of the problems to provide facilities, services and jobs on the islands. A lot of work to be done here.